Scottish immunotherapy company TC BioPharm (TCB) has announced it has signed an agreement to work alongside clinical academics at University College London (UCL). The agreement will see TCB and UCL progressing innovative gene-modified T cell therapies capable of treating childhood and adult cancers of the blood such as acute myeloid leukemia (AML). In the UK alone this disease affects over 3,000 new patients annually. At UCL’s Great Ormond Street Institute of Child Health, a pioneering research team led by Professor John Anderson and Dr Jonathan Fisher has developed a new chimeric antigen receptor therapy (CAR-T), which significantly enhances the innate ability of gamma-delta T cells to attack blood cancers such as AML. They are doing so by targeting CD33, a cancer antigen highly expressed in AML. This key intellectual property has been licensed to TCB by UCL Business (UCL’s technology commercialisation company) to further strengthen TCB’s IP position in the gamma-delta CAR-T space. Novel cancer treatments, such as CAR-Ts, are generating interest based on recent encouraging clinical data. CAR-T treatment involves removal of a patient’s white blood cells, insertion of a gene which targets a specific cancer antigen/type, followed by re-injection of the cells primed to attack the tumour. Harnessing the innate anti-cancer properties of gamma-delta T cells, TCB has developed an innovative, safe CAR-T therapy which overcomes toxic side effects seen with other treatments. Working with UK-based cancer-research hematologists, TCB and the UCL clinical academics aim to bring next-generation safe CAR-T technology to patients during 2018. Work is ongoing at TCB’s cleanroom facility in Scotland to manufacture a GMP-compliant CD33 CAR-T product. Headquartered at the Pentlands Science Park outside Edinburgh, TCB is registered in Scotland (SC 453579). Becoming operational from February 2014, the company is developing ImmuniCell®, an autologous anti-cancer immunotherapy which involves expansion of gamma-delta T cells over several weeks – formulating a treatment for a wide-variety of different tumour types. In January 2015, TCB’s cell therapy manufacturing facility at Maxim Office Park in Glasgow was awarded a Manufacturer’s Authorisation for Investigational Medicinal Products MIA (IMP) which permits manufacture and release of Advanced Therapy Medicinal Products (ATMPs) for use in clinical trials. Further to obtaining an MHRA manufacturing license, TCB was granted a Clinical Trial Authorisation (CTA) by the MHRA in September 2015. Phase II/III clinical studies of TCB’s unmodified core technology (ImmuniCELL®) are ongoing throughout the UK. Europe is experiencing an unprecedented cancer epidemic, driven by an ageing population. Traditional cancer treatments such as surgery, chemotherapy and radiation therapy have demonstrated very limited efficacy for patients with late-stage disease and often cause considerable side effects. Cell therapies are the next breakthrough in oncology, but autologous cells must be harvested from each patient, expanded for several weeks in vitro and re-administered to the same patient while hospitalised. TCB is developing a novel gamma-delta CAR-T platform (ImmuniCAR®) where T cells are supercharged using gene-therapy to target and kill specific cancer types. ImmuniCAR® represents a truly disruptive, step-changing approach to the treatment of a wide variety of cancers with potential to overcome many of the safety problems previously seen with conventional early-generation CAR-T products. 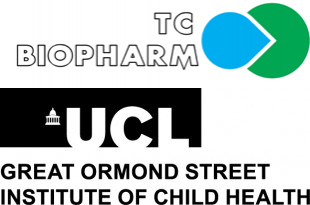 The UCL Great Ormond Street Institute of Child Health is part of the Faculty of Population Health Sciences within the School of Life and Medical Sciences at UCL. Together with its clinical partner Great Ormond Street Hospital for Children (GOSH), it forms the largest concentration of children’s health research in Europe. UCL Business PLC (UCLB) is a leading technology commercialisation company that supports research and innovations arising from UCL, one of the UK’s top research-led universities. UCLB has a successful track record and a strong reputation for identifying and protecting promising new technologies and innovations from UCL academics. UCLB has a strong track record in commercialising medical technologies and provides technology transfer services to UCL’s associated hospitals; University College London Hospitals, Moorfields Eye Hospital, Great Ormond Street Hospital for Children and the Royal Free London Hospital. It invests directly in development projects to maximise the potential of the research and manages the commercialisation process of technologies from laboratory to market. For further information, please visit: www.uclb.com.